Like the semi-mythical hominoid thought to roam northwest forests, big wild steelhead are often best tracked in winter — and in the least-traveled places. SOMEWHERE IN OREGON – We are in an early 90s mud-covered Pathfinder 4×4 on a half frozen, snowy, logging road making our way into a canyon in the heart of a 60,000-acre forest. It’s still dark and snowing pretty hard — big spring flakes. 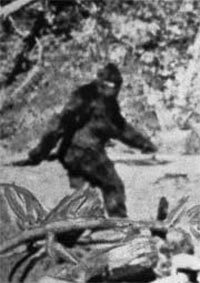 “I’m not sure if you guys are into this sort of thing, but there have been quite a few big-foot sightings in this area,” says Jakob, bouncing a bit from behind the wheel. We slowly push deeper into the forest and mud goes flying everywhere. My fishing buddy and I were on a guided fly fishing trip on an Oregon coastal river well known for being not well known. 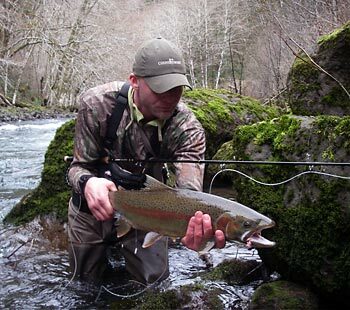 This would be a special outing on one of the Pacific Northwest’s best wild steelhead rivers. We would be accompanied by fly fishing guide Jakob Lund, who would help us find, and maybe catch, a particular strain of steelhead that ranges from 12 to 25-plus pounds. We will be carefully approaching spotted steelhead due to this strain of fish’s wary nature. These fish typically spook or explode. This is sight fishing at it’s finest! As we make our way towards the bottom of the canyon, I am saddened by the realization that I will not be able to return to this place even with my four-wheel drive Subaru. Jakob mentions there is a chainsaw in the back of his truck for the trees that often block the road and for the really deep mud holes. He simply says, “hold on” and punches the accelerator for maximum forward momentum. It won’t be until the ride out, in the light of day, that I realize just how scary the drive in actually was. When we arrive at the river, a combination of caffeine and adrenalin has me unusually amped for 6:45 AM. We hop out of the truck into the damp snowy darkness to gear up and the first thing I notice is the rushing tumble of the river. Even though it is pitch dark I have a sense of where the water is, the size, and what she looks like. As I put on my waders by the light of my headlamp I see the light of a train approaching in the distance. It takes longer then expected because the train moves at a pace in between a jog and a fast walk. The sound of the train and river, mixed with the wet snow and excitement of what’s to come, is perfect. Just as we finish rigging up the sun rises just enough to offer my first true glimpse of the river. It is about 30 yards away, and a shallow pool of water is coming into focus. Jakob informs us this is the “parking lot pool” and that fish have been caught here. The three of us stare at the pool for what feels like hours. Once we are sure there are no fish we venture off downstream, along the railroad tracks in search of big scary monsters that hide out deep in the woods of green Oregon. We walk for about a mile and half through train tunnels and over bridges in country that time has seemingly failed to remember. Finally, Jakob spots a fish and we follow protocol: we freeze, sneak away backwards, and set our gear down. We then crawl up to the edge of the bank and look down on the river and the fish below. “There — a male with a female. A good situation as the male will probably take a fly,” Jakob assures us. For five minutes we watch the behavior of the fish — where they swim, where they hang, what they are doing. Mike and I look at each other and try to be polite by offering each other the first crack and then quickly reason the only gentlemanly way to decide is with a round of Rock, Paper, Scissors — winner takes all. After a tie with Rock I prevail on the next throw with Paper. I’m in. Jakob tells me to take a mental picture of where the fish is, attaches a radio to my jacket and sends me up trail to access the river so as not to spook our prey. I walk up river about 40 yards, head down to the water, and then begin creeping my way back to the place where I remember the fish was. Then I hear the sound of a slow moving train making its way upriver along the tracks. ‘This can’t be good,’ I again think to myself. And sure enough, it’s not. After waiting five minutes for the train to pass and another five minutes for the fish to settle, Jakob informs me that the fish are gone. After walking another mile and half Jakob spots another fish. Again it’s a male and female and they are right on the bank. This time Mike is up to bat and he makes his way upriver to circle around and begin his hunt. I stay down below and watch the action unfold. Mike makes about six casts before I see his indicator streak across and down the river. Mike’s fly is 40 yards down river before I can shout, “Set the hook!,” and unbeknownst to me the battle is already lost. Turns out Mike was not able to set the hook on account of his rod hitting a tree during the critical moment. The fish is gone and we are 0 for 2. A few miles later I have another chance. This time it’s a single male and it’s large. Jakob estimates 15 pounds. I drop in and begin drifting my egg pattern down to the fish. I look to the peanut gallery up on the bank after each drift to gauge what is happening. Looking at their faces, I can see the fish is interested in what I have to offer. After casting the egg about ten times I feel the tug I’d been waiting for and know immediately I’m not stuck on the bottom or a branch. I am finally connected to a giant steelhead. As I take in the slack line to fight the fish on the reel the realization of what is unfolding hits me and this is the last conscious thought I have as I enter into the zone only steelheaders know well. I wrestle with this fish for ten minutes, dancing along the fine line of fighting him too hard or letting him go too far back into the current. Eventually the fish begins to show signs of tiring. The first time I bring him toward Jakob for a possible landing, the fish takes off and runs with the same energy he had when I first hooked him. The fight continues for two more rounds before Jakob makes a final attempt to grab what we can all see by this time is a beautiful 15-pound buck. Only this time as I raise my rod to bring him in one last time the fish flops away from the bank, the fly pops out, and the greatest fish I’ve ever been connected to is gone. The fish disappears back into the wild — Sasquatch style.